This reindeer popcorn is also very simple to make, I usually have it ready in 5 minutes and then it needs 25-30 minutes for the chocolate to harden. If you lay the popcorn out on a sheet pan you can place the pan in the fridge for a faster setting time. An easy popcorn mix that comes together in 5 minutes! 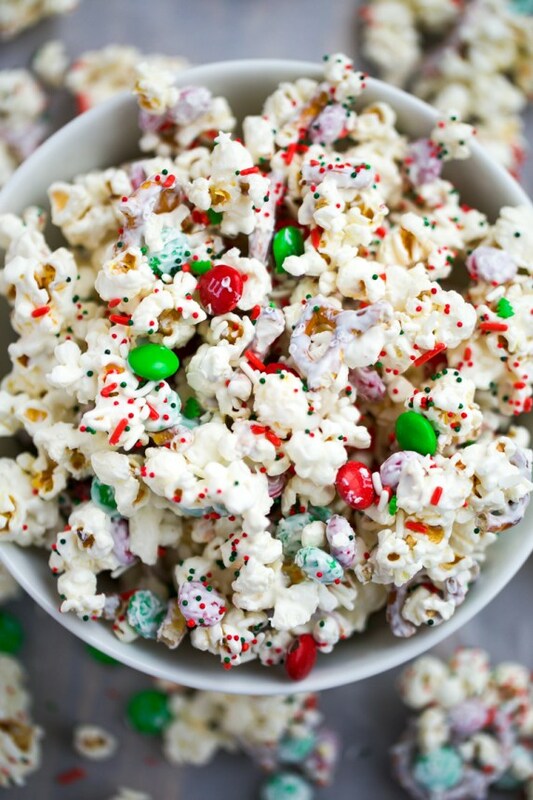 White Chocolate Reindeer Popcorn is perfect for Christmas or to make all year round. Line a jelly roll pan with foil or parchment paper. Set aside. Pop your popcorn in a popcorn maker or in the microwave if using microwaveable popcorn. Once the popcorn is done add it to a large bowl, add in the broken pretzels, and half of the M&M's. Melt the vanilla candy melts in a microwave safe bowl for 30-second intervals, stirring well after each interval. Microwave until the chips are smooth and melted. Drizzle half of the melted candy into the popcorn bowl, stir until everything starts to look coated. Add in the rest of the melted candy, and M&M's, stir until everything is coated. As soon as everything is coated sprinkle on sprinkles so that they stick. Then spread the popcorn mix onto the prepared pan and let sit until hardened and cooled. Break into pieces, and store in an airtight container.